While it may not be the scariest of films, Dario Argento's Suspiria (1977) is certainly among the most beautiful. Filmed on the last Technicolor system in Europe, and awash in colored lighting, it is a candy-coated confection and a grueling, bloody horror at once. It is like a dose of arsenic covered in cream. The narrative, written by Argento and then-lover Daria Nicolodi, is slight: a young ballerina, Suzy Banyon (Jessica Harper) enrolls at an exclusive European dance school. Strict, dark, and forbidding, the academy holds a threatening secret. Following the murder of a former pupil on the night Suzy arrives, she begins to unravel the mystery of the school and its enigmatic founder, Elaina Marcos. From this bare plot, Argento builds an atmosphere of tension and dread. Beautiful as it may be, every frame of the film seems to hold something terrible just outside the frame. Suspiria was Argento's first major non-giallo directing job, but it doesn't stray too far from the style he established in his previous film Deep Red. Like it, Suspiria wallows in Gothic excess. The near hysterical tone to its murder sequences orders on operatic. Again, Argento employed Goblin to score the film. Dissonant, throbbing, and threatening, it is every bit the equal of the Deep Red soundtrack. Suspiria is, ironically, one of Argento's least violent films. It relies more on tone and atmosphere than on stalking and slashing. But when the killings come, they pack a wallop. The opening double-murder is one of the most awesome death scenes ever filmed. It is at the same time both horrific and breathtaking. When the camera pans past the wrecked bodies of the two victims, one doesn't know weather to recoil in horror, or gasp at the rich, sumptuous visuals. Argento has said that Suspiria was originally written for a younger cast, and it is here that it gains one of its greatest strengths. Casting the lovely, wide-eyed Jessica Harper, in her early twenties, in to the role of essentially a lost child, the film takes on an almost dream-like quality. Her fellow students act like children; their teachers have the countenance of strict, overbearing nuns. Even the sets are designed to make Suzy appear overpowered and small. Near the climax, she sneaks around the school, trying to uncover a secret passage. She passes through darkened quarters, past the glinting knives of the kitchen staff, and into a room decorated with a floral design that seems to be grasping at her shirt-sleeves. The sequence has the vibrant, swirling colors of a Disney film, the claustrophobic dread of Kafka, and the oppressive bewilderment of Alice in Wonderland. Special mention must be made of the cinematography. Taking his cue from Mario Bava, Argento, together with his director of photography Luciano Tovoli (Tenebre, Julie Taymor's Titus) and set designer Giuseppe Bassan (Tenebre, Inferno, Cannibal Ferox), creates a vibrant, colorful film quite apart from the standards of the genre. Instead of stark, foggy, black-and-white shadow plays, he gives us the colors of a 40s musical. The camera is alive with it. And when he does fall back on fog and shadows, they are lit with rich blue and red gels. It's all very artificial, but absolutely stunning. As an added effect, Tovoli removed the color filters from the negative printer. The colored film strips bleed into one another around the edges, creating a look that is more like a living, moving painting than photograph. In the end, the plot and storyline are less than they appear to be. For all of its dreadful atmosphere, bloody acts, maggot infestations and animal attacks, there is nothing to hold it all together but perhaps the logic of a nightmare. When the mystery is revealed, most viewers will be left scratching their heads. From the drenching rain and dripping blood that opens the film, to the fire-and-thunder climax that closes it, there is little cohesion and little to pull the viewer from one scene to the next. The more times one watches, the more shallow the plot is revealed to be. But it is the gorgeous visuals, the pounding score, and the dreadful atmosphere that will bring the viewer back, again and again. Submitted by stephen36 on Mon, 2010-10-11 02:21. 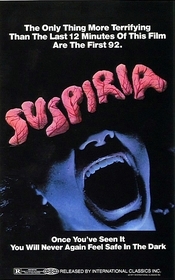 For me "Suspiria" is and remains to this day one of the most beautiful and chilling horror films ever made. It was the film that introduced me to the world of Italian horror and i have been a big fan ever since.